These days it’s almost impossible to avoid the online community and customer feedback. Think of that as a good thing! Make the effort to be aware of reviews of your gym or studio and be prepared to respond. The secret is first knowing where to seek them out and then responding to them, before you find yourself digitally tarred and feathered. Of course some of what you get is going to be positive. However in business it’s almost impossible to do anything that provides a customer experience that’s universally loved. Misunderstandings and miscommunications can occur even in ideal conditions. Just be prepared to respond to members writing things online. Customers who write reviews are either going to be happy or they’re going to be unhappy. You are probably going to hear from the extremes. Customers who are contented or just apathetic are less likely to make a comment one way or the other. Be prepared for strong opinions, whether you find them flattering or you think they’re unfairly harsh. Another dimension to comments and reviews is where they get posted. These divide up into two types as well. Those where you control the site and those that you do not. Examples of those you control would be your website or Facebook page or anything else where you have authority as a moderator or editor, the ones you don’t are everything else. But mainly they are forums, websites and social pages that are beyond your control you may have a chance to make some sort of input or response, if you have access and the comment catches your attention. Positive reviews on sites you control like your Facebook page and website are always good to see. If someone has had a good enough experience that they want to share it make sure you respond with suitable gratitude. Start a dialogue with your advocates and show that you are a gracious host. 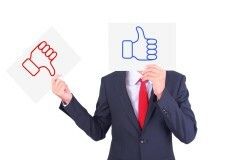 Negative reviews are perhaps the most valuable resource in the online community. What you will find are all of the things that you need to address, change or improve but no one tells you about in person. Try to respond and take the actions that will correct the problem that cause the negative review in the first place. These are great too! You will get found by searchers who go to review sites and search for local gyms and studios, they’re like free advertising. These positive reviews will have extra credibility with the audience precisely because they are out of your control. Look out for sites where you may run into negative reviews. The perception of anonymity may cause people to complain more freely. The answer is to spend a little time each week searching for keywords that relate to your gym or studio. If you can afford the staff give someone the responsibility to monitor the sites and search terms that are likely to relate to your gym. In handling negative reviews it really helps to take the attitude that a complaint is a cry for help. People want to feel like they have some value as customers. You should make sure you acknowledge them for any comments they make. In every case remember the risk of making things worse or escalating by pouring fuel on the fire. Also, if you find negative reviews that aren’t credible or clearly false, remember that the audience is likely to see them that way too. Respond to every review you get, no matter the medium, because they are like gold dust. Good reviews are great, they are like free advertising, show some gratitude. Bad reviews are your chance to learn what needs to be changed and then to fix it. Just knowing that they were heard is often enough to help many people forget and forgive. What is your business’s strategy in monitoring and responding to reviews?